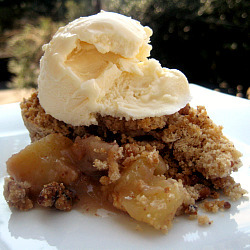 I LOVE all forms of apple crisp…this version sounds heavenly! It sounds weird but people go CRAZY over it!! by the way…5 min plank?! Very impressive! i’ve totally been craving apple crisp but hubby isn’t big on cooked apple anything (crazy, i know!) but my mother in-law is coming next week so that might just be the time to cave in and make some! looks good! 5 minute plank!! That is awesome, Jennifer! I still don’t know how you do it all. Do you stick to a strict schedule or something? The apple crisp looks delicious! I’ll definitely have to try this one out… I love fruit desserts! Jennifer, this is very good, I made it yesterday but I need to find something almost this delicious. Two sticks of butter in this recipe is only for the young at heart!